Which is why I formulated Rose Diamond Eye Cream. Like everyone else, I spend huge amounts of time staring at my computer, my phone and the TV screen. So I wanted to create an eye cream that would fix multiple problems in one quick effective solution, working holistically on the entire eye area on lids and arches as well as the under-eye, to lift the whole area and minimise puffiness and dark circles. 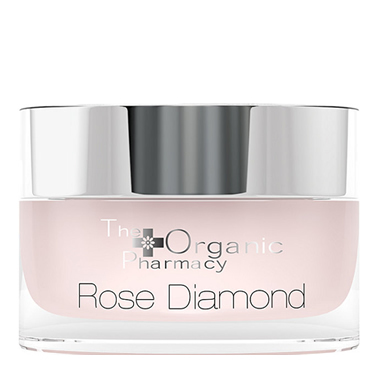 Rose Diamond Eye Cream is an upper, lower and eye contour treatment made from a combination of state-of-the-art ingredients. Some of these super-active ingredients work instantly and others gradually over time to plump, smooth, brighten, reduce puffiness and fade dark circles as well as lifting and filling the skin around the eye area. Rose oil is in abundance not only because it’s a powerful antioxidant but also because of its natural ability to boost collagen production, and reduce inflammation. Acmella oleracea has been whisked in because of its organic botox-like effect. This powerhouse helps instantly smooth lines and wrinkles by reducing muscle contractions, just like Botox but without the needles or chemicals. Hyaluronic acid (biotech algae) with 3 different molecular weights offers intense and immediate dermofilling hydration to plump and fill lines and wrinkles. *Independent trial conducted with 24 female volunteers aged 40-79 years old with upper eyelid folds and crow’s feet wrinkles applied twice daily for 2 months.